It was not immediately clear if, as part of the plea deal with Mueller, Manafort would cooperate and provide any information to the special counsel’s probe into Russian interference in the 2016 election. Shortly after the story broke, the prosecutor confirmed that Paul Manafort is cooperating with the special counsel. CNN is reporting that Manafort has already given information to the Department of Justice (reminder that a report from earlier this year contained a nugget saying that Trump has told friends and aides that Manafort can incriminate him). 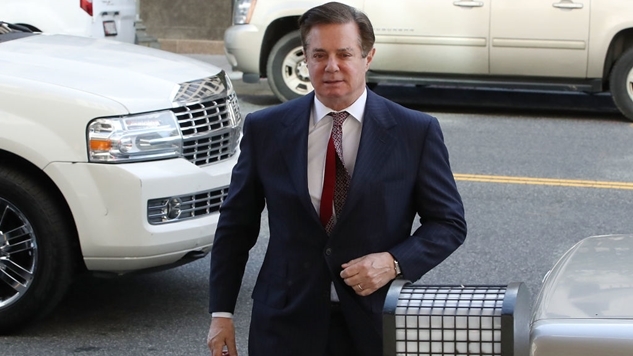 Last month, Paul Manafort was found guilty on eight of eighteen counts of fraud by a jury in the Eastern District of Virginia. He had another trial coming up this month, and this plea deal was his way of avoiding it. He pleaded guilty to conspiracy to obstruct justice against the United States and for money laundering, tax fraud, bank reporting and FARA foreign agent disclosure. The latter charge is just a fancy way of saying he got caught moving money around and doing shady stuff for oligarchs—you know, normal Washington D.C. stuff (the worst thing to ever happen to Manafort was winning an election, if we had President Hillary Clinton right now, Manafort would still be peddling the influence of foreign nations in our nation’s capital). If this all comes as a surprise to you, you probably didn’t see this incredibly telling clip during the 2016 campaign. Mueller announced a new superseding criminal information against Manafort. Defense lawyer Ken White looked over this document, and to his trained eye, it's quite extraordinary. /2 Review: in federal court if you're charged with a felony you have a right to be indicted by grand jury. An "information" is a charging instrument used when (a) it's a minor crime for which indictment isn't required or (b) you're going to waive indictment and plead guilty. /3 It's only two counts — conspiracy to defraud the united states (all the pre-charge stuff he did) and conspiracy to obstruct justice (the post-charge witness tampering). But the descriptions are lavishly detailed. /6 I could be wrong of course. But it appears that the information is calculated to make it more politically painful to pardon Manafort — to make a preemptive strike on the "he was unfairly prosecuted for old stuff that was nothing" narrative. /7 Not yet seen: the plea agreement, which will discuss how the two cases (this DC one and the Virginia one where he was convicted) will be harmonized and what sentencing range they will be talking about. One last key detail is that as part of Manafort’s plea deal, he will forfeit bank accounts and properties worth $46 million dollars—meaning that the Mueller investigation just paid for itself more than twice over. There is still much to be determined on this front, but this is a devastating development for President Trump and his legal team. The 38-page information document is extraordinary in its scope, and it lays out detailed counter-arguments to Trump’s “witch hunt!” tirade, and the cost of the investigation is of no concern now that Manafort’s wardrobe full of ostrich jackets could pay for a second Mueller investigation all on their own. Buckle up, folks. This isn’t the end of Trump’s legal problems with Manafort, it’s the beginning.